Send Delicious Pineapple Cake - 1 Kg to Chennai. Gifts to Chennai. Send Cakes to Chennai. Description : For individuals who love pineapple, this 1 Kg Eggless pineapple cake will be a wonderful treat for them. 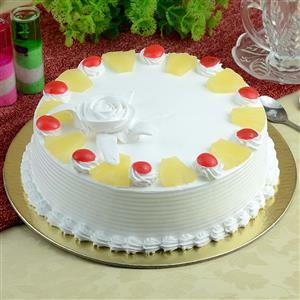 Pineapple essence cake topped with whipped cream, it will certainly bring a smile on your loved ones face. Thus, send this cake to your loved ones in Chennai and give them a lovely treat. Moreover, you can also send this cake with other Gifts to Chennai through Gift2Chennai.com. Please Note : Picture is indicative. Actual will vary.